We have shared our opinion before that social media is basically made for the home and building market: it’s visual, it encourages engagement and it gives homebuilders a way to truly interact with homeowners. We wanted to ﬁnd out which of the top 50 big builders are performing best on social media and not just in terms of audience size. In fact, we found that often times, companies with the biggest follower base had lower engagement rates. That’s why this report delves deeply into what the most engaging big builders are doing across Facebook, Instagram, Twitter, Pinterest and YouTube to give you some great insights and hopefully inspire your next efforts. We used Rival IQ to analyze social media posts across all social channels for the top 50 big builders published by Hanley Wood. We analyzed post data across a six-month period beginning August 1, 2018 through January 31, 2019. We gathered data using Rival IQ’s cross-channel ranking capability, as well as channel-speciﬁc rankings for Facebook, Twitter, Instagram, Pinterest and YouTube. We are reporting the Top 50 rankings for total engagement, ratings of engagement per post, applause (reaction), conversation (interaction), amplification (sharing), total audience and total activity. Engagement is deﬁned as measurable interaction on social media posts, including likes, comments, favorites, retweets, shares and reactions. Engagement rate is calculated based on all these interactions divided by total follower count. We’ve also provided rankings for each individual channel. 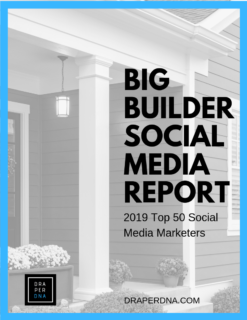 The report is rich with insights and information about the top 50 big builders and their social media marketing efforts. There are also a few surprises to share with you. Lennar is the leader in total engagement, applause, conversation, activity (number of posts) and the number of followers (audience) in our cross-channel review. It is apparent in this study they understand and enlist the power of social media in their marketing efforts. The Villages is the leader in cross-channel engagement rate per post at 6.20% versus the median rate per post is 0.27% or 23 times better than average. This suggests they are providing valuable content. Habitat for Humanity is the leader in cross-channel amplification (AKA sharing), which is a strong indication of the value of the content they are providing their followers. They like the content so much they share it with their followers. Habitat is also a leader on Twitter, which supports a content strategy of sharing their news frequently. The study shows being a leader in the number of posts is not an indicator of success. Well-produced, valuable content shared at a proper cadence to a target audience is the definition of success as defined in this report by Lennar. Instagram is proving to be a high influence channel based on engagement rates that True Home USA and David Weekley Homes have recognized. Toll Brothers has found a place on YouTube to reach their audience. Video is a powerful medium that can connect with the viewers in a personal way. Many builders in this survey are not using YouTube. Pinterest appears to be a big opportunity for most builders as it is highly visual, preferred by women and is particularly influential with SEO. CalAtlantic appears to be leveraging this channel well. Content is the most valuable investment a builder can make to be successful in using social media as a vehicle to publish and distribute the stories they want to tell. A word of caution about the “sea of sameness” we are seeing in the posts by all builders. Using the same type of images and copy creates “chronic boredom.” Use social listening to learn what is important to your customers when building your editorial calendars. We can see from these findings having the greatest number of followers or the greatest number of posts is less impactful than providing valuable content which engages your audience. We dug deeper into the research to determine the best social media and content strategies and executions that are driving the leaders to the top of their respective rankings. The research includes examples of the best performing posts and pins across channels, the type of posts that perform best, the kind of media that ranks strongest, best days and time of day to post, and more. All of this research can assist these builders, building products manufacturers and others to improve and optimize their investments as social media marketers. The only thing remaining is the commitment and expertise to make it happen.